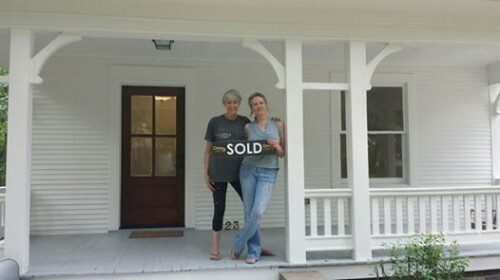 Siobhan and Molly Spain, two sisters in a large family full of creative people, set out to transform a house in the North of Grand neighborhood this year. The project fell under the umbrella of their joint venture, Balen Blanken, an old family name that they’ve adopted for their renovation projects that combine elements of art, sustainability, and respect for good craftsmanship. The house was in rough shape. Water damage from leaky plumbing on the second floor had caused mold, crumbling plaster, and wood damage right through the core of the house. 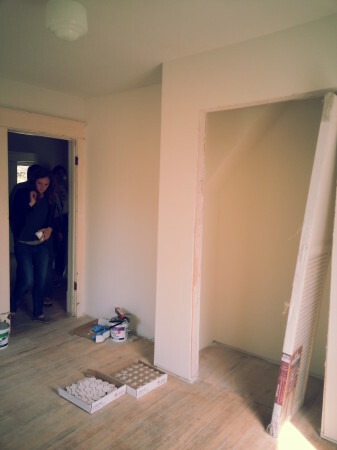 It required extensive gutting of the walls, rebuilding of some wood features, and mold remediation. 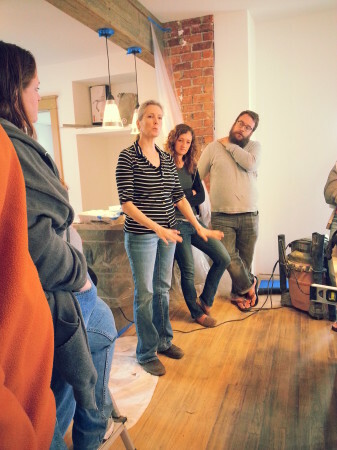 We visited them on May 10, 2014 while they were in the process of painting, laying tile, and finishing floors. In addition to rebuilding walls and refinishing wood, they re-designed the kitchen to be more open and connected to the dining area. 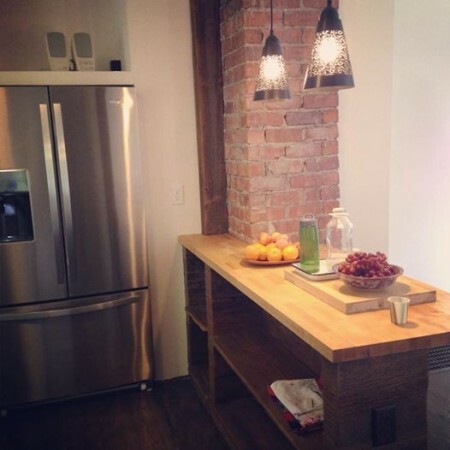 Using the exposed brick for texture and some reclaimed barn wood for accent trim, they created a re-defined space in the open plan kitchen. 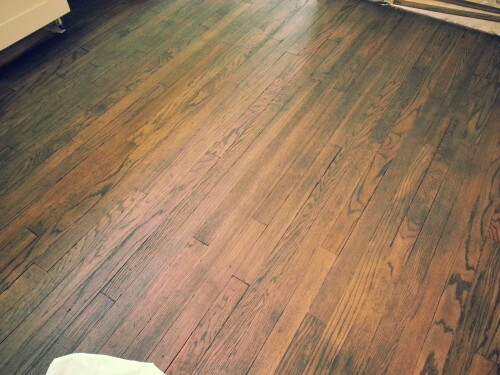 Dark stain on the hardwood floors helped mask discoloration in the wood and helped differentiate the kitchen from the dining room. 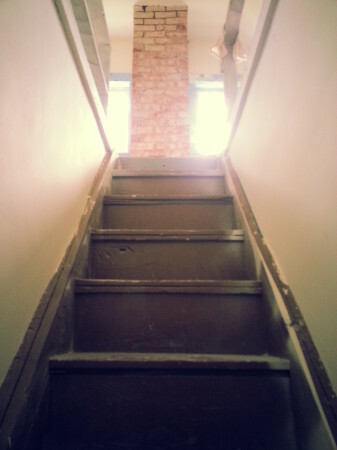 The staircase required major reconstruction but was looking nice and stable when we visited. 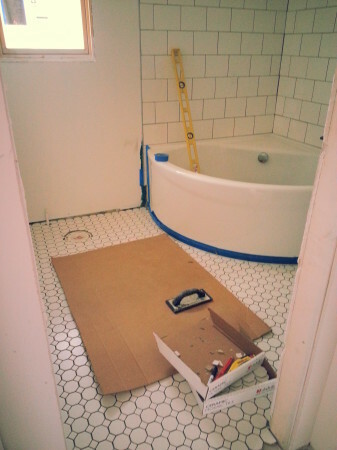 Upstairs, a creative remodel of the bathroom featured crisp white tile and a cool corner tub. 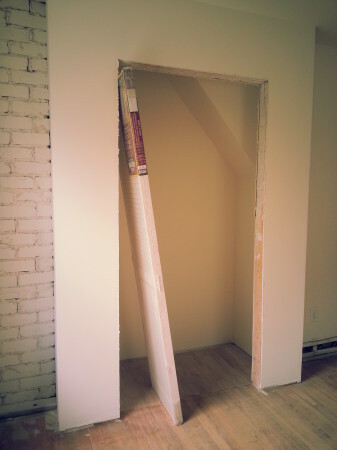 Bump-out closets added in two bedrooms provided much-needed storage space in a way that only encroached a few inches into the walking area. 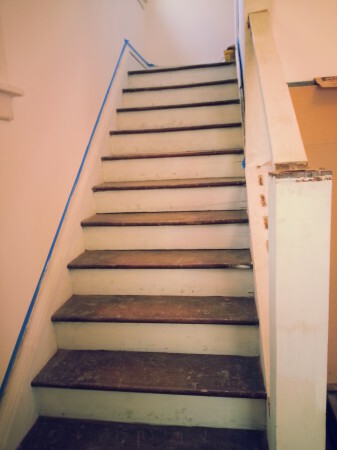 The closets were positioned against the attic stairs so gained a few extra inches under the stairs. 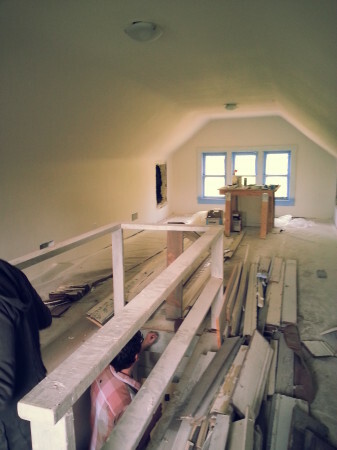 Venturing up the attic staircase, we found a unique space that would make a great playroom, office, or guest room. 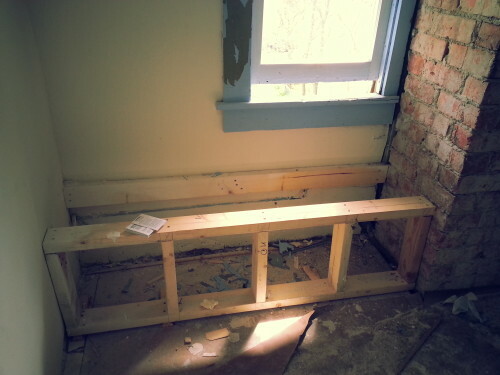 Some creative construction would add some window seat benches. 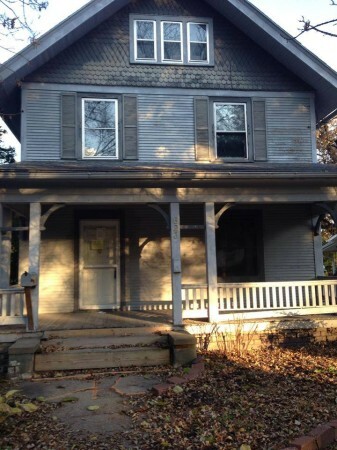 Moving back to the ground floor, we noticed that this house is rich in good quality porches. 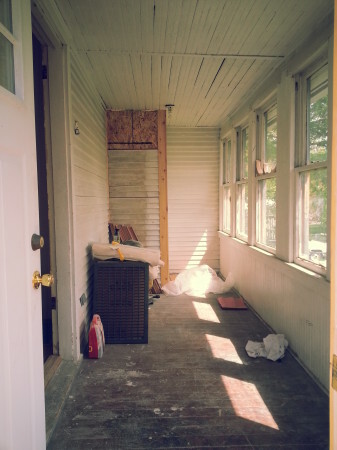 This enclosed back porch off the kitchen gets plenty of sun and is sure to see some herbs and garden plants in its future. 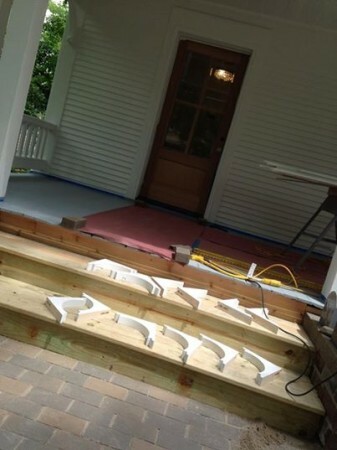 With some TLC the front porch has also been brought back to life, with new paving, new steps, and freshly sanded and painted adornments. It’s a perfect place to show off that hard-earned SOLD sign! 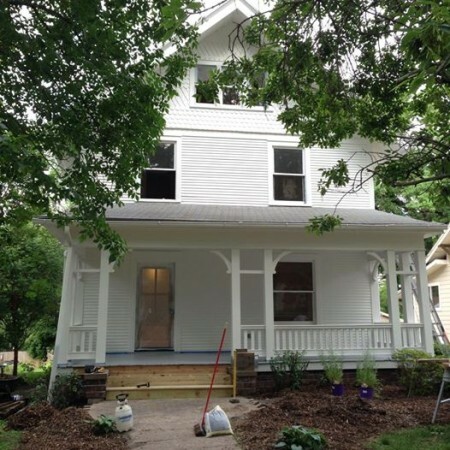 This beautiful 100 year old house is ready for its next hundred years, thanks to the hard work and dedication of these ladies and their team!